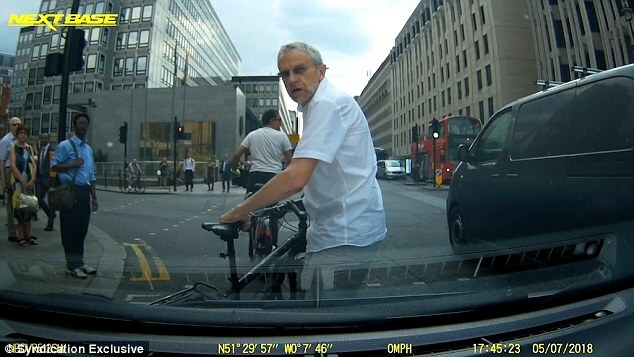 This is the shocking moment a brazen cyclist dismounts and uses his to attack a car after a motorist beeps him for cutting into the road near Westminster Abbey. Charlotte Pierzchniak was driving in central London on Monday when two cyclists cut in front of her. After she beeped the men cycling, one appears to initially ignore her while the other turns around and begins to ‘verbally abuse’ her. Prisoners were regularly abused by their guards. 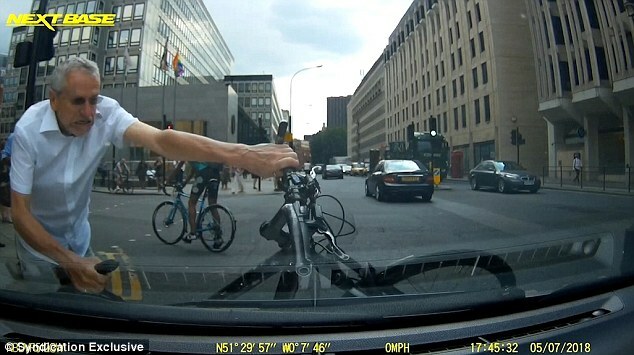 As the driver is trying to turn left, the first cyclist stops immediately in front of her and straddles his bike. He then turns to her and begins to shout, waving his hands around. The second cyclist, then comes back to the car, walking his bike by his side. He approaches the windscreen and throws his bike against the bonnet, forcing the car to shake. The man, who is visibly angry then approaches the driver’s window and knocked on it to lower it down – which Ms Pierzchniak did not do. 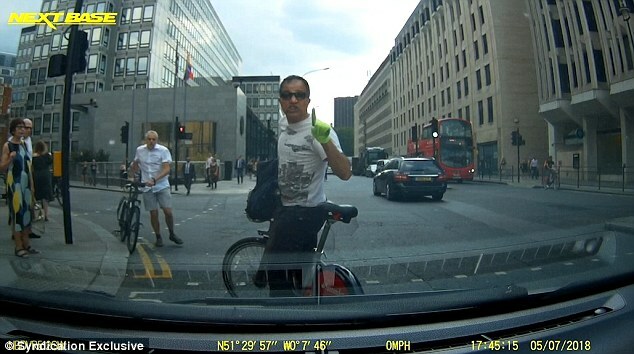 He walks back to the bike, but falls off as he is shouting at the driver while trying to mount it. He pulled on his helmet and straddled the motorbike. As he gets back up, the furious man picks up the bike with two hands and slams it into the vehicle. With one hand on the handle bars and the other on the saddle he struggles to pick the bike up and hit the wheels into the bonnet of the car. As he cycles off stunned passerby look on in shock. After the disgruntled cyclists scurry off Ms Pierzchniak attempts to turn left, to the dismay of a pedestrian that was illegally crossing the road on a red light. I usually cycle to work. The mouse scurried across the floor. They were scurrying around like ants. He is leaving the department, much to the dismay of his colleagues. She discovered, to her dismay, that she had locked her keys inside her car. The audacious jaywalker, perhaps inspired by the cyclists angry outbursts, raises her finger to the driver. 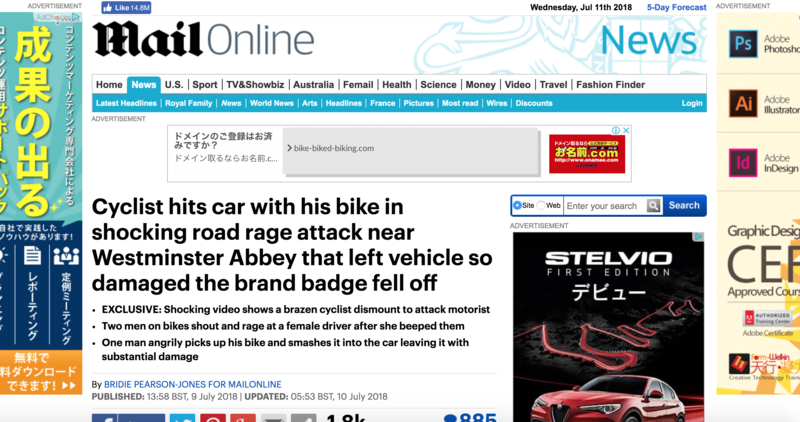 The cyclist caused so much damage the brand badge of the car fell off. 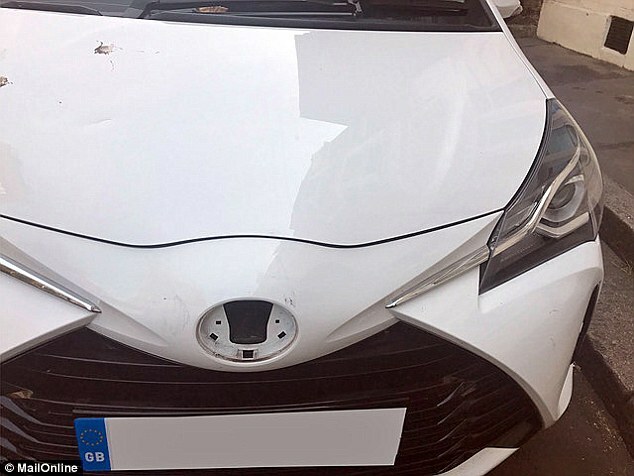 ‘A cyclist cuts me up in London, then verbally abuses me for beeping, then falls off his bike and then hits my car with his bike. The car maker’s audacious goal is to compete with the luxury cars of other manufacturers. He described the plan as ambitious and audacious. We nearly ran over a couple of jaywalkers who walked out in front of the car. I got/was cut up several times on the motorway this morning – I’ve never seen such dangerous driving! 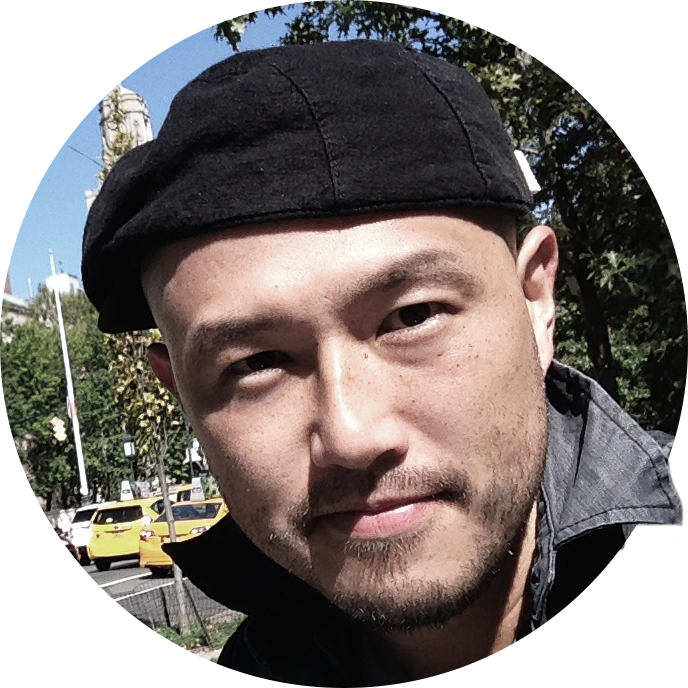 ‘Then a woman wags her finger at me for taking off on a green light while she is jay-walking. Literally has to be seen to be believed,’ Ms Pierzchniak told MailOnline. Metropolitan Police said they could not find any reports related to this incident. He wagged his finger sternly at the two boys. The prices in that place have to be seen to be believed!